It will be worth the wait when Hotel Müller re-opens after renovations taking place from the end of 2018 until finished. With the same care and attention, the work is being done carefully and not necessarily to a tight schedule as this is a historic building needing to be carefully updated and altered to still retain its character and be able to serve day and staying visitors each according to their needs. We'll let you know when it is due to re-open. 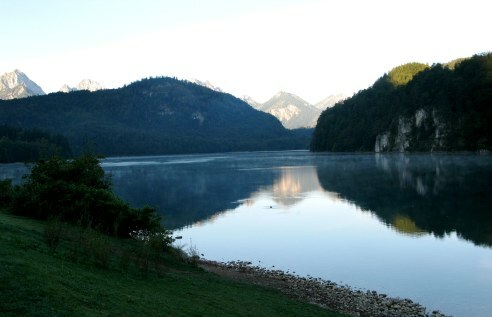 When visiting Neuschwanstein Castle, we had chosen to stay right at the castle’s doorstep, in Hohenschwangau – translated as ‘the high country of the swans’. 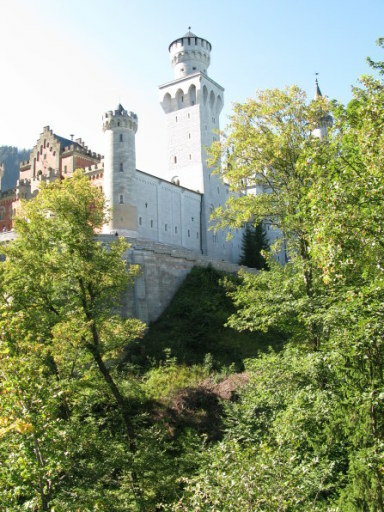 Hohenschwangau castle reconstructed upon the ruins of another ancient castle by Ludwig’s father, Maximilian II. 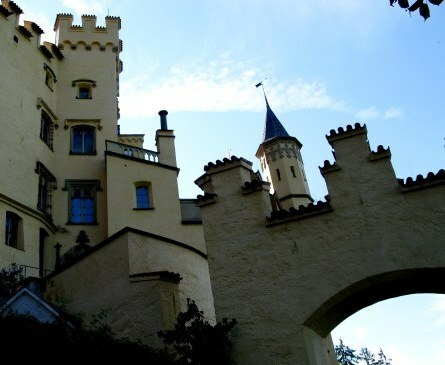 It is no accident that the Hotel Müller Hohenschwangau has an ideal location, for it has a long connection with both castles. 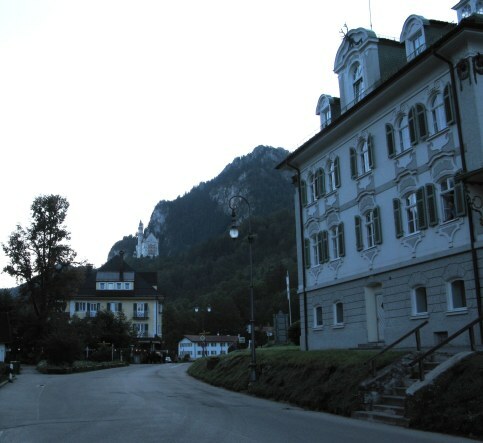 You can see just how ideal this is in this photo of Hotel Müller on the left in the curve of the road below Neuschwanstein. If you are lucky, you could have a bedroom with a terrace from which to overlook either castle. 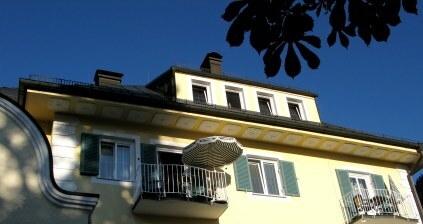 Hotel Müller Hohenschwangau is next to the Tourist Bureau, the only place one can purchase tickets to visit the castles. We had opted for a package that included tickets of entry to both castles, overnight with breakfast, and a ‘gala’ four-course evening meal. It was truly excellent value. The first night we were late arriving and found a fruit platter waiting for us. 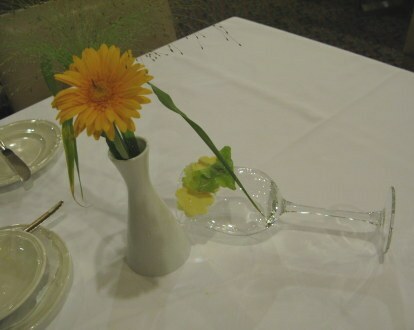 We selected from the à la carte menu and in my usual fashion of speaking with emphasis from hand gestures – much to the amusement of the waiting staff, I knocked my fortunately empty wine glass into the butter dish – squashing the butter to form a piece of art itself in a hotel where art was everywhere. 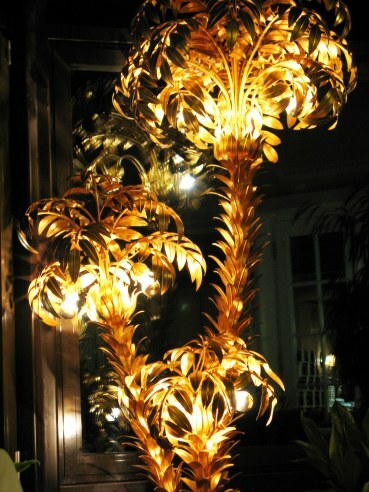 There was art in the form of the elaborate light stand in the dining room alcove. 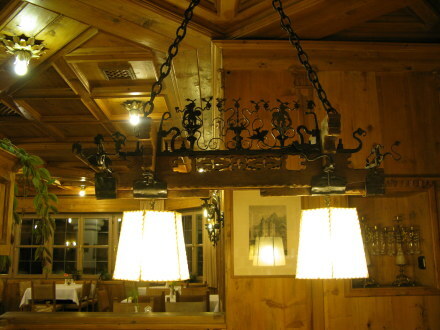 It could be seen in the Bavarian features of cut metalwork on another lamp in the dining area. ... that accentuated the modern design of the lobby. 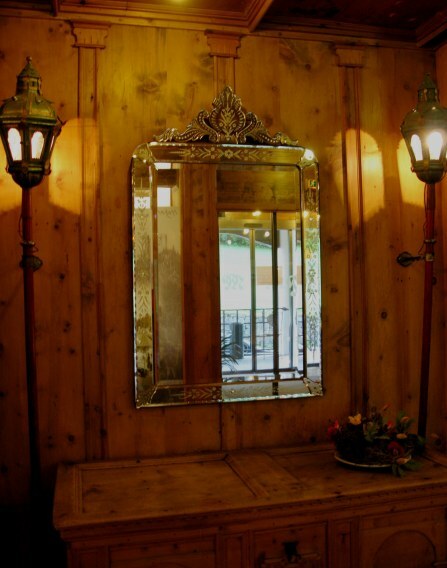 A lovely mirror reflected the entrance. 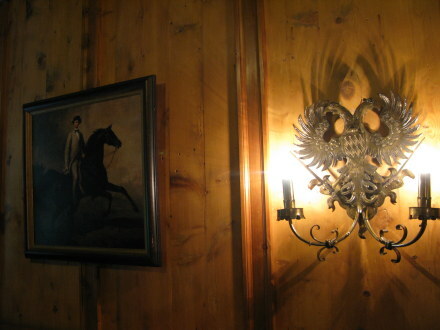 The swan wall lamps reflected feathers against mahogany in the hallway. 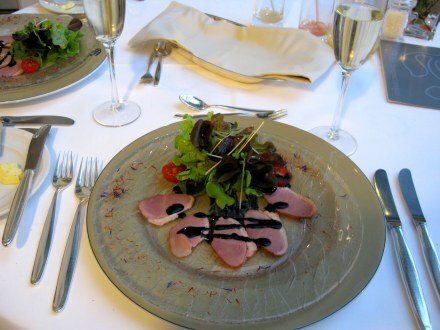 Then there was the art of the food itself at Hotel Müller Hohenschwangau, be it at the beginning of the meal, or at the end. I always like to read the dessert menu first and work back from there. 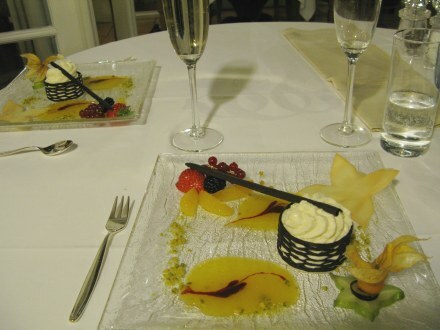 The way I look at it, everything needs context - and making the dessert decision first gives the meal context as you await that final enjoyment. 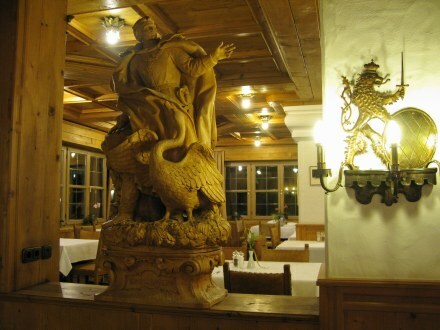 .The hotel has been in the hands of the Müller family ever since it was established – following an earlier lodging that sat in the same location and also owned by the family – for those attending the castle of Hohenschwanstein. 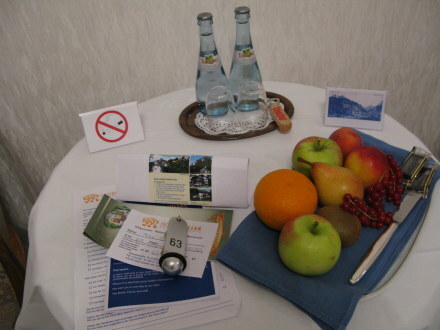 (Here I must disclaim any personal benefit or sponsorship for writing about Hotel Müller. I do so in reward for the exceptionally friendly service offered. 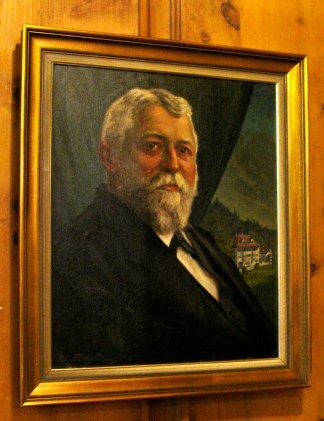 The patriarch of the family Müller still watched over the family business from his framed portrait in the hallway. His family provided the transportation of the building materials and artisans that built both Hohenschwanstein and Neuschwanstein. 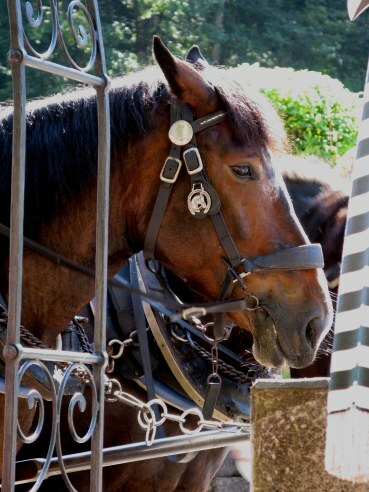 It is therefore no wonder that with their horse-drawn cartage business being their foundation, Hotel Müller became the starting point for the horse drawn carriage rides to Neuschwanstein castle. The Hotel Müller staff form a happy band who obviously enjoy people. All the other elements of a good hotel are there, but this is its real point of differentiation. 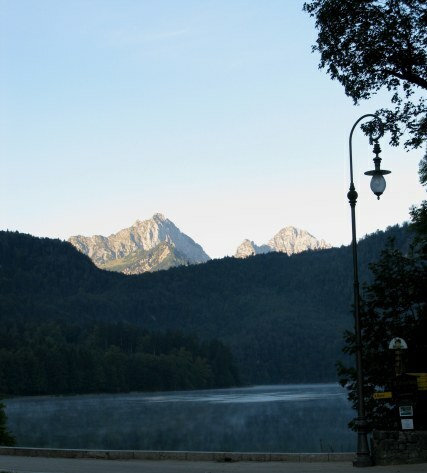 By staying right at the foot of Neuschwanstein Castle, you have an opportunity to appreciate the serenity of the location before the rest of the tourists arrive. The dawn was just sleepily creeping over the mountain tops and early morning swirls of mist lifted off the pink coverlet that had covered the Alpsee lake at night. In the quietness, the occasional leap of a fish left a perfect set of concentric ripples behind – like embroidery on pale blue silk. For generations, the Müller family and their teams have proudly and warmly welcomed people from all over the world. From my experience, their genuine liking of people is revealed in the way you feel you are not a guest, but a friend who is imposing slightly and therefore really ought to contribute financially towards the upkeep! 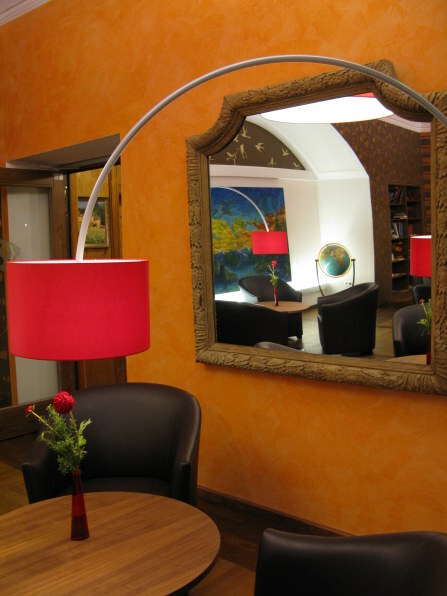 It will be worth the wait just to stay in the newly remodelled Hotel Müller. Don't worry. We will let you know when it is due to re-open. When you do, I am sure you will enjoy your stay.